SKJØR, Betty & The Bass & Fuzzystar play Teviot on Monday 11th September. Returning to Edinburgh after an amazing set at Electric Fields in Vic Galloway’s Music From The Big Pink Tent SKJØR will bring their live show to Teviot Underground as part of Edinburgh’s Freshers Week. 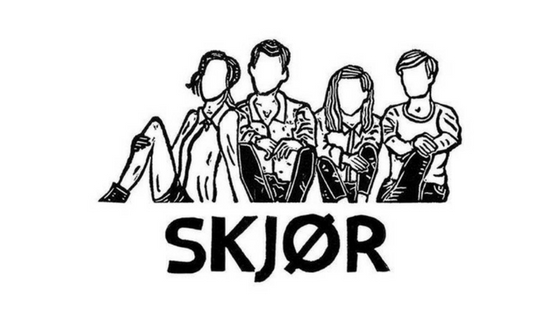 SKJØR are a Scottish indie band with dark, haunting vocals and dreamy guitars, tipped by Vic Galloway of BBC Radio Scotland as one of the most promising bands to watch this year. They have just released a brand new single ‘Living Without You’ and they continue to go from strength to strength. This vibrant three piece have been bringing country/grunge vibes to Central Scotland for almost 3 years now in a variety of projects. Lyndsey, Ben & Willie take influence from the likes of Johnny Cash, Pixies & Fleetwood Mac, creating a unique style that sets them aside from your average indie band. They have a debut EP ‘Bad Magic Tricks Part 1.’ out on 15th September. Edinburgh-based Fuzzystar perform indie rock filled with narrative, melodies and lo-fi fuzz. Clash described them as “Off-kilter indie pop laden with dream-like fuzz” whilst Gigslutz reckon their music contains “Infectious reverb strewn hooks”. Other comparisons have been made to Built to Spill, GBV, Sun Kil Moon and Dinosaur Jr. With a debut album positively received and airplay on BBC 6 Music and Radio Scotland, 2017 is turning into a good year for these guys. Tickets are £5 on the door or free if you have a Freshers band.